In 2003 I thought there must be a way of keeping bra straps out of sight.. Did everyone know something I did not? I discovered there were a few products in haberdashery and trimmings shops.But obviously not many people used them because in the summer time drooping straps are to be seen everywhere. I did a survey and found that most women just pushed the offending strap back and the overwhelming majority, young and old , found it very annoying. Again the overwhelming majority thought showing straps were unsightly and said they would actually pay more for a garment if straps were kept out of sight somehow. With the help of the University of East London Design Lab I got a prototype made and found a manufacturer. I was thrilled to be short listed for The British Female Inventor of the Year in 2003. StrapTrap was launched in 2004 and is now used all over the UK by bridal shops, couture dress makers, alteration and repair specialists, and costume and dress designers. In 2005 StrapTrap won a gold medal at the prestigious British Inventors Show in the New Consumer Product category..
StrapTrap © is an award winning addition to the trimmings and haberdashery notions available to both the couture and home dress making seamstress. It is neat secure and easy to fit. Whether it is dressing for the big day, a new party dress or just a summer T shirt StrapTrap will do away with the dreaded VBS (visible bra strap). 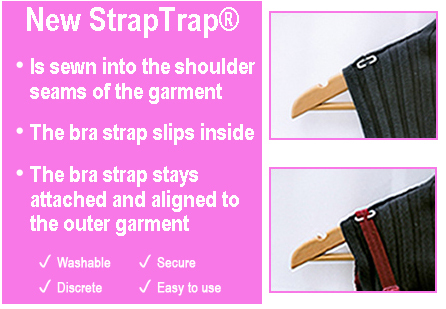 StrapTrap can replace the need for invisible bra straps or strapless bras because it secures the bra strap to the garment so it stays put and out of sight. So unfortunately does the underwear!